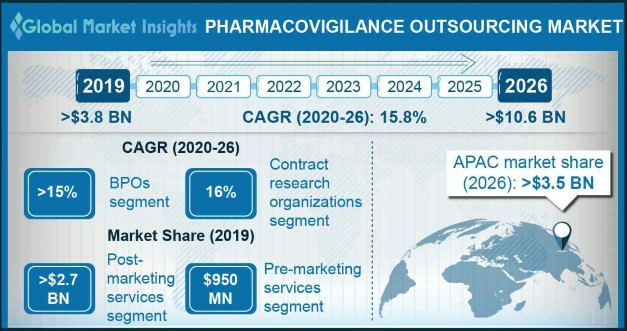 Pharmacovigilance outsourcing market size was valued at USD 2.8 billion in 2017 and is expected to witness 15.7% CAGR from 2018 to 2024. 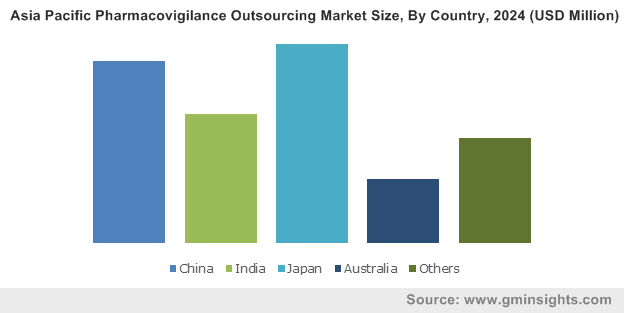 Increasing number of adverse events and other safety concerns associated with medical products is a major factor driving the global pharmacovigilance (PV) outsourcing market growth. Adverse drug reaction (ADR) monitoring is required for each medicine throughout the its life cycle, during drug development process such as pre-marketing that involves early stages of drug design, clinical trials as well as post-marketing surveillance. Ability of these PV outsourcing facilities to offer common PV functions such as case handling and data entry along with niche activities including signal management and aggregate reporting to various pharma, biopharma and medical device companies will accelerate the business growth. Benefits offered by outsourcing facilities over in-house compliance functions will serve to be another positive impact rendering factor in the PV outsourcing industry growth. Pharmaceutical industry is witnessing robust growth in recent years owing to advancements in drug development process leading to new product launch. These companies rely on PV activities that are either done in-house or are outsourced. Issues associated with setting up in-house PV department coupled with various challenges such as high costs to maintain required levels of compliance, and need for qualified and trained in-house resources will surge the demand for outsourcing PV activities to service providers such as CROs and BPOs thereby accelerating industry growth. However, risks associated with data security such as misusing patient’s data for detrimental purposes may hamper the pharmacovigilance outsourcing business growth during the forecast period. Pre-marketing services segment accounted for considerable revenue share in 2017 and is projected to show 15.6% CAGR during the analysis period. Increasing investment of pharma companies in new drug development will favor PV business growth. Growing need of pre-marketing pharmacovigilance activities to collect information regarding adverse drug reactions from the pre-clinical screening and phases I to III clinical trials will accelerate the segment growth. Post-marketing services segment held the largest revenue share in 2017 and is estimated to grow considerably over the forecast period. Rising incidences of adverse drug reactions that may be missed in patients with comorbid diseases during the trials, will increase the demand for post-marketing PV functions such as adverse event case analysis and reporting as well as quality control. Growing adoption of pharmacovigilance IT solutions and services such as designing & development of safety data repository, implementation, integration of safety data and validation will further spur the segment size. Contract research organizations (CROs) segment was valued at USD 1.9 billion in 2017 and is estimated to grow substantially over the forecast timeline. Increasing dependence of small biotech firms on the CROs for various pharmacovigilance activities will lead to increase in segment size. Growing preference of the drug safety teams in the small and mid-size companies to outsource case management activities to CROs that reduce the cost of setting up in-house PV unit and enable time management will foster the market growth. Business process outsourcing (BPOs) segment will show robust CAGR of 15.4% over the analysis period. The growth can be attributed to increasing demand for knowledge-based processes including case processing, medical review, benefit risk management and safety surveillance offered by the BPOs. Moreover, focus of BPOs on inculcating advanced technology within the software that help in generating superior quality pharmacovigilance reports to ensure data integrity that reflects patient’s safety will augment the segmental growth. 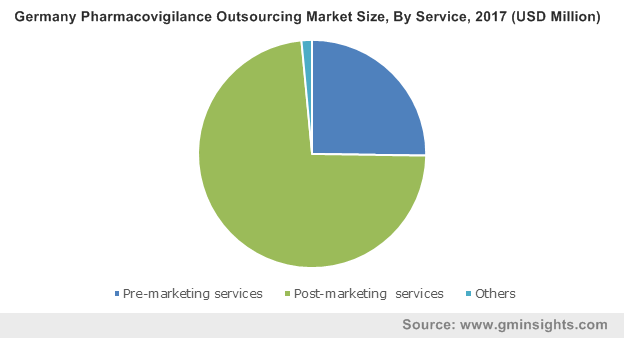 India pharmacovigilance outsourcing market is estimated to show robust CAGR of 15.8% over the forecast period. High growth is attributable to the stringent and favorable regulations set on Indian service providers to improve quality of pharmacovigilance services. Availability of prominent service providers offering various PV functions at lower costs coupled with presence of talented healthcare professionals in the country will further escalate the India pharmacovigilance outsourcing business growth in the coming years. 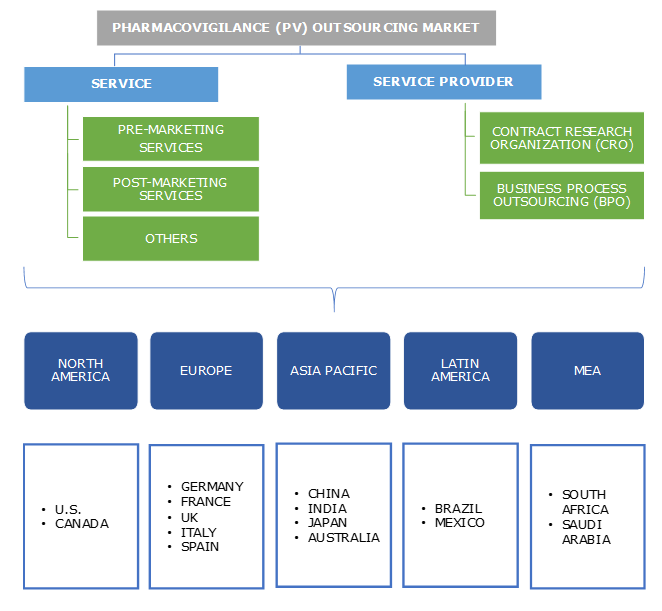 Some of the key industry players operational in the pharmacovigilance outsourcing market include Accenture, Bioclinica, CliniRx Tangent Research, Clintec, Cognizant, Covance, Ergomed, Genpact, HCL Technologies, IBM, ICON, iGATE, iMED Global, Infosys, IQVIA, Medpace Holdings, Novartis, Oracle, Parexel, PRA Health Sciences, SIRO Clinpharm, Symogen, Syneos Health, Tata Consultancy Services (TCS) and Tech Mahindra. Industry players are primarily focusing on strategic acquisitions, merger, agreement, and addition of services to existing portfolio to strengthen market position and capitalize on market opportunities. For instance, in March 2018, PAREXEL International Corporation launched Integrated Medical Writing Solutions, that offer a wide variety of communication services, needed at every drug development stage and commercialization process. This strategy will broaden company’s existing service portfolio thereby accelerating company’s revenue growth. The history of pharmacovigilance can be tracked in 1980s when a young patient in England died due to chloroform anesthetic used before removal of an infected toenail. Thus, U.S. Federal Food and Drug Act was established in June 1906, to ensure drugs for purity and free of contamination. Later, in 1938, the Federal Food, Drug and Cosmetic Act was established in with an aim to renovate the public health system. It was after the thalidomide disaster caused in 1961 when the first systematic international efforts were undertaken to address drug safety issues. The Sixteenth World Health Assembly in 1963 adopted a resolution addressing the need for early action in regard to rapid propagation of information on ADRs. This led to creation of WHO Pilot Research Project for International Drug Monitoring in 1968. Uppsala Monitoring Centre (UMC) was the first WHO Collaborating Centre to be established in 1978. Later, the International Society of Pharmacoepidemiology (ISPE) was founded in 1984 and the European Society of Pharmacovigilance in 1992, that marked the beginning of pharmacovigilance in research and academic world, along with its integration into clinical practice. Later, in the early 1980s, the Council for International Organizations of Medical Sciences (CIOMS) and WHO developed a program on drug development and use. The adoption of CIOMS recommendations by the International Conference on Harmonization (ICH) in the 1990s led to a significant impact on international drug regulations. Later, some serious adverse events associated with drugs and medical products during the 20th century, increased the pressure on businesses and governments to produce legalization and guidance, as well as evolution of regulatory bodies to ensure patient safety. Over the last 50 years, PV has evolved as an international initiative and a scientific practice. Drug safety has moved into spotlight and patient safety has gained supreme importance for regulators and pharmaceutical companies. Outsourcing in the pharmaceutical market has grown massively over the last decade. It has become a standard practice among the multinational companies to develop global sourcing programs. The outsourcing of pharmacovigilance functions offer flexible solutions to various pharma, biopharma and medical device companies. The trend seen in drug safety services has paralleled the trends seen in the clinical research and product development services and is expected to grow during the forthcoming years.